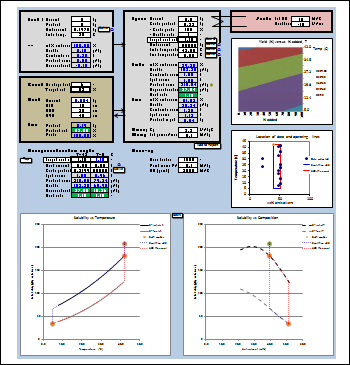 We were delighted to release in April our new crystallization process design toolbox, having spent much of 2015 working with customers to better define requirements and piloting the toolbox as it developed in several live sessions. Inspired by the user interface of our successful solvent swap model, the Main Inputs tab serves as a dashboard for designing and visualizing your crystallization process. You can get a good intro to the toolbox from the preview webinar we recorded in January 2016. In short, we combined several of our popular crystallization utilities, enhanced them and then automated the building of a crystallization kinetic model in the background. That model is ready to use for parameter fitting and detailed process predictions if you have suitable experimental data. As you might expect, you can generate a solubility curve within seconds of pasting your data. You can also make quick estimates of operating profiles (cooling and/or addition) for controlled crystallization. And you can estimate the final PSD from the seed PSD and mass. That's all within a few minutes and before using the kinetic model. The toolbox supports both design of experiments (helping make each lab run more valuable) and design of your crystallization process, especially in relation to scale-up or scale-down. There's a dedicated training exercise that walks you through application to a new project. We'd be delighted to hear your feedback in due course. A lot of the good 'flow' puns and quotations are already well used by us and others. However, the words of Brutus in Shakespeare's Julius Caesar do seem quite apt for the current momentum behind continuous manufacturing / aka 'flow chemistry'. Scale-up Systems was delighted to attend Flow Chemistry III in Cambridge, UK, March 14-16, where an international group of practitioners from academia, industry and continuous reactor vendors assembled to share state-of-the-art work in this area. A strong take home for Scale-up Systems was an oft-repeated message that DynoChem and reaction kinetics are key tools for implementation of Continuous Manufacturing of APIs. Prof Frans Muller of Leeds University made a presentation that covered in detail how kinetic motifs can be used to explore the Design Space with limited experimental data and this message was echoed by Malcolm Berry who noted that a wealth of process knowledge was obtained with a kinetic model that would not have been possible via a DoE approach. You can find relevant tools in our online library with this link. Watch out for a new utility coming shortly for modeling a sequence of unit operations based on residence time distribution models.